John's old waders: before the leaks got intolerable. While trying to be brief, I left out some information that would help readers who do not have waders. The explanations are footnoted in red, below. 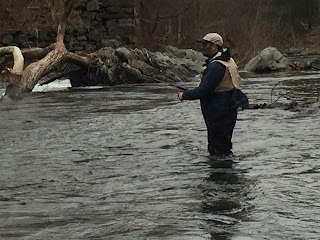 In a recent post, I described the joy of buying new boot foot waders (1) from The Beaverkill Angler in Roscoe, New York. Part of the description was an observation that these waders were more expensive than a pair purchased 25 years ago. After spending time in these Orvis Encounter waders on recent fishing trips, I know more about my purchase. And I now realize the waders cost more for reasons beyond price changes over the decades. These new waders are breathable (2). When fishing larger streams in humid summer weather, this will make fishing less of a steam bath. They have a capacious front pocket, large enough to hold several items. The pocket has openings on both sides, like the openings on a hoodie sweat shirt. On a recent trip in cooler weather, having a place to tuck the hands and get them warm was very welcome. Despite learning more about these features, most of my other comments and advice about purchasing waders remains the same. They are worth repeating, in case you are buying or asking someone to buy waders for a holiday gift. To avoid waders filling and sinking the angler, make sure the pair has belt loops, and, if possible, a belt (3). The Encounter waders have belt loops and a belt. Based on a quick survey of prices online, a wader belt can cost between $9.00 and $24.00. Keep that cost in mind when weighing the comparative prices of waders. If possible, shop for waders at a store with a big selection. There’s a lot variation in fit even among waders labeled the same size. Think about where you will be doing most of your fishing. For example, my friend Pete fishes for steelhead in the winter. He is considering insulated waders, rather than waders where the angler provides insulation with extra clothing. If you do not buy insulated waders, consider buying a pair that are a bit larger. This provides room for an extra sweater, wool shirt or parka in colder weather. In fact, if you have cold weather gear, take it along while shopping and see how the waders feel when you are wearing it. And finally: read the directions. In my haste to wade leak free, I did not closely read the information in the labels. I missed that the waders were breathable and that there are special care instructions for breathable material. Waders are a means to the end of enjoying fishing. 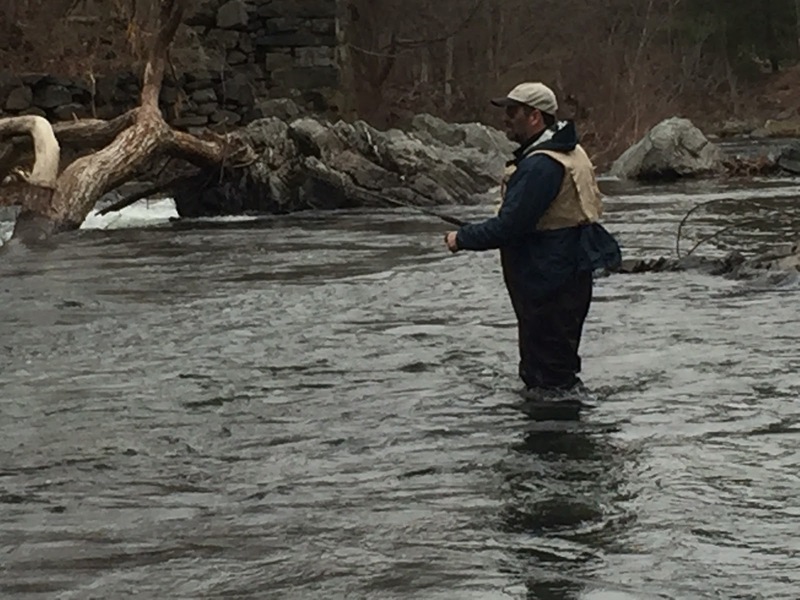 Even in December, there’s plenty of places to enjoy trout fishing. Many states have streams where fishing is permitted year ‘round. If there’s a warm, or less cold, day and if holiday preparations are under control, time astream might be just the thing for it! (1) A "boot foot wader" includes both the wader and the boots. 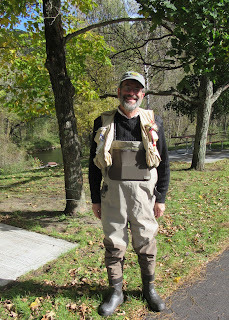 "Stocking foot waders" include the wader and no boots. An angler buys wading shoes in addition to the waders. This allows the angler to choose a sole that provides the most stability depending on where he or she will wade. (2) A witty friend asked "So, the new waders breathe underwater - sort of like fish, eh?" I think the breathable material is something like Gore-Tex. I should go back and read the instructions to see what the material is. (3) A wader belt is located about halfway between one's shoulders and waist. It is a belt but is in a different position than a belt on a pair of pants. If a person has a wader belt and falls, they will get some water in the top of the waders, but the waders are not likely to fill from the feet up to the top and drown a person.